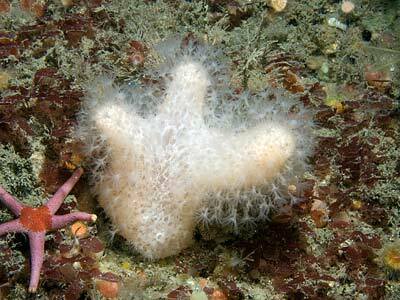 Description: Colonies of this common soft coral are variable in shape, forming large irregular masses up to 250mm high, usually with a few blunt 'fingers' which are usually more than 30mm in diameter. 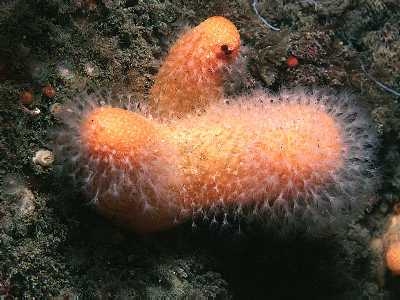 The colour varies from white to dull orange with yellowish or brownish colonies occurring occasionally; the polyps are translucent white. On the west coast of Ireland almost all colonies are orange in colour. Habitat: Grows attached to bedrock, boulders, stones or shells, usually in places with strong water movement. From the lower shore to about 100m. Distribution: Common on all coasts of Britain and Ireland and throughout the northeast Atlantic, south to Portugal. Similar Species: The other two species of dead mens fingers in this area are Alcyonium glomeratum and Alcyonium hibernicum but these are much rarer and are unlikely to be confused with this species. Large, irregular colonies usually with short, thick, blunt 'fingers'. White or orange in colour, occasionally yellowish or brownish. Picton, B.E. & Morrow, C.C. (2016). Alcyonium digitatum Linnaeus, 1758. [In] Encyclopedia of Marine Life of Britain and Ireland.